Our children are more imaginative than those born 20 years ago! Despite claims that this generation of children have less time for play, a recent study by Case Western Reserve University finds that today's children are more imaginative than those born twenty or so years before. 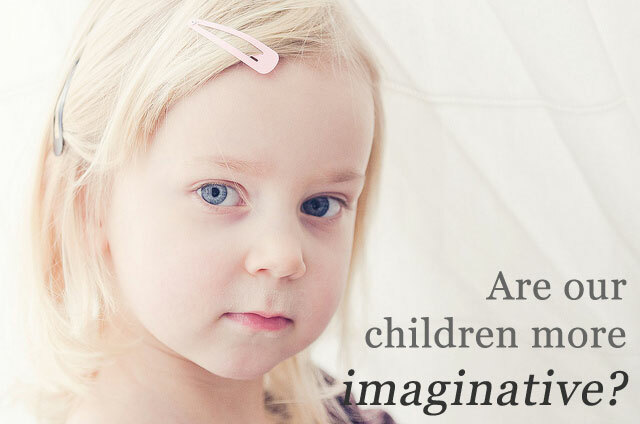 How has imaginative play changed over the past two decades, and should we embrace it? Since the 1980's, the amount of time children have to engage in play has decreased significantly. In schools, the time allotted for recess has decreased, while out of school children are engaged in activities or technological activities (television, video games and the internet). Surprisingly, a collection of studies from the period 1985-2008 shows that the level of imagination demonstrated by 6-10 year old's during sessions of "pretend play" has increased, as has the level of "comfort". These results were evaluated by Sandra Russ and Jessica Dillon who conclude that "more recently, children were more imaginative in their play". Participants of these fourteen studies were met with individually and given two neutral puppets and three blocks with which they could play with however they liked. "It is encouraging that these cognitive and affective processes in play have remained the same or improved, given the decline in unstructured time for children" explains the research. But what should we make of these results in light of the decrease in time for unstructured play over the past two decades? Since children "maintain the same desire to play", it may well be that "children are resilient and may be finding ways to develop imagination and make-believe abilities other than through play." Video games and increased exposure to a wide range of television programmes and the internet may affect our children's imagination more than we would suspect. Furthermore, "the complexities and challenges of modern culture require creative problem-solving and imagination to function from day to day". In my opinion, it is still essential that children be allowed time each day for unstructured play; to allow their imaginations to run wild in the creation of games and fun activities in which they may explore their creative side and make sense of the world around them. It is widely known that play time facilitates development, particularly among younger children, and as parents it is our responsibility to ensure they have the time and space in which to engage in free play. Given the technological stimuli and social pressures now experienced by our children, do you believe our generation are more or less imaginative (and creative) than we were? Please feel free to read the research for yourself and leave your comments or opinions below.